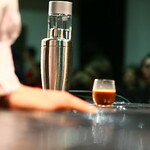 Western Regional Barista Competition, Berkeley, CA. March 28-30, 2008. Hosted by Pacific Bay Coffee Co.
WRBC2008: Chris Baca, " Barista's Barista"